When you click on the link of E Return Setup the first page will contain two functions one for Addition of Establishment and the second one is for Selecting and Logging in the selected establishment. In addition function ,you can select Region Code and Office Code by selecting an office name from the list.When you select an Office name from the list then it will automatically fill the box for region code and Office code,then you have to enter the Establishment Code which is a 7 digit number and Establishment extension and click ADD button, it will show a message “Establishment is added sucessfully”. When an Establishment is successfully added then from the list (SELECT ESTABLISHMENT) will contain the list of all added Establishments, from this you can select your Establishment and click OPEN button for opening the Tool for the selected Establishment.When you click on the OPEN button, Login Page is displayed and this page contains the Establishment ID in the top right corner of the page. To login the user has to first select the establishment for which he has to enter data or generate return. Once an establishment has been added, select the same from the establishment code field and click open button. The software supplied has a default user name ‘admin, and default password ‘admin’. The system allows the user to create/delete new/existing users and to change password. However the admin user cannot be deleted and only his password can be changed. Admin user only can change the Contribution and other parameters (such as wage ceiling, contribution rates etc, based on which the amounts are calculated in the Returns generated through this software). It is advised that the employer keeps the admin role with himself and sets the Contribution and Other Parameters. He may create users for the data entry/upload of the data and generation of all Returns and Reports and allot such user id to subordinate staff. a) Login after entering the used id and password. b) On the main menu, click ‘Master’. c) In the sub Menu click ‘Establishment’s Details’. d) The screen for the entry/selection od details will open. e) In case the data was entered earlier, click ‘EDIT” to make changes. f) The establishment Code number will appear on the basis of the establishment added and for which the login has been done. By default the status appears as unexempted under each Scheme and can be changed. Enter the date of coverage as per the order issued by the EPFO Office while intimating the Code number. On press of Tab Button, Applicable date of Pension Scheme is auto populated with the same date of coverage but can be edited in case the Pension Scheme was applied to your establishment from a different date as compared to the Provident Fund Scheme. In such case the applicable date for Pension Scheme will be taken as the date of joining for Pension for all members who joined between the two dates. h) After entry/updation at the time of some change in the data such as address, exemption status etc, click ‘SAVE’. i) A message stating ‘Information updated successfully’ will appear. k) The Main Menu will appear. On the Main Menu, click ‘Master’ and then from the sub menu click ‘EMPLOYEE MASTER’ Click ‘ADD’ Button. Screen will allow entry of Account Number (code number of the establishment not to be entered anywhere again), Name, Father’s /Husband’s name, date of birth, gender and date of joining. These are mandatory fields and are as per the Form 5. In case of a female, the husband radio button can be selected, in case the name given is of husband in the Father’s/husband’s name field. Field for Marietal status of member is also there and the user can select the correct status. The fied is however not mandatory and in case the data is not entered in this field, the status by default is married. Through this screen any past service of member can be entered. The flags for international worker and disabled worker are ‘N’ by default but can be changed to yes. In case of International worker, the passport details can be entered after clicking the link for it. The date of leaving and reason can also be entered through this screen. This feature is also available in the screen for monthly wage data entry. The flags for the higher wages for Provident Fund and Pension Fund can also be updated. By default these flags are ‘N’. 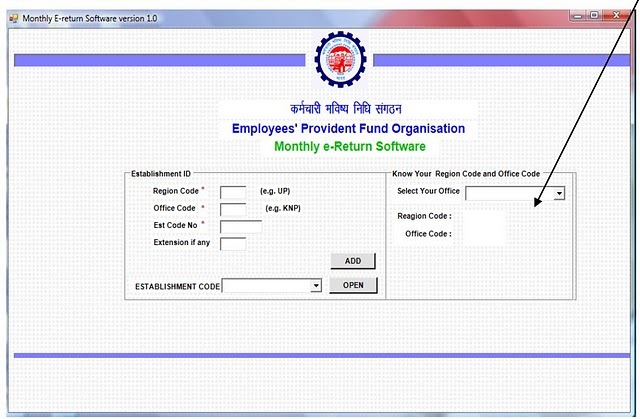 The screen also allows to enter the e-mail id, mobile number, address and bank details of the employees. These are not mandatory but if entered, they will help in faster settlement of claims. After entry of the data, Click ‘SAVE’. Message ‘Record saved successfully’ appears. Click ‘OK’ The details of the member appears in the view bar below. Click ‘ADD’ for next member and repeat the process. In case the establishment is having the details of employees in digital form that is in any system, the data can be uploaded in this software and there is no need to make any data entry.